At Wassenburg, we know that a clean and disinfected endoscope is an important prerequisite to ensure safety for every patient and each procedure. 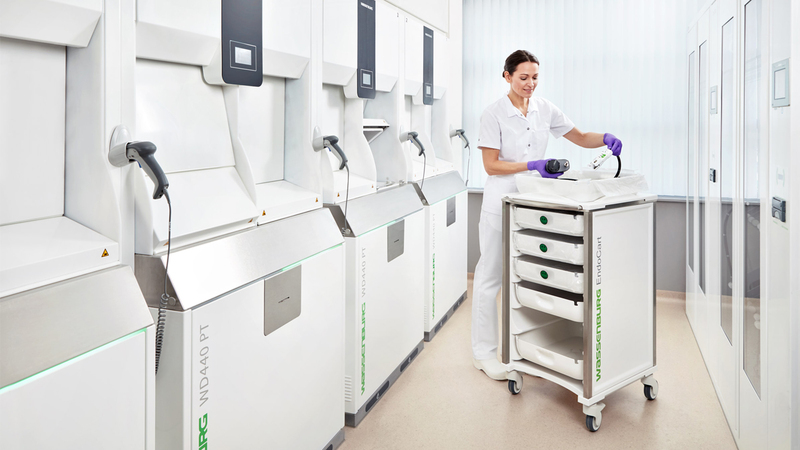 But we do more than that – we offer a complete range of systems, consumables and services covering all aspects of the endoscope reprocessing cycle: the total solution. Our Washer-disinfectors and drying cabinets wash and disinfect, and then dry, condition and store to the highest standards there are. Each step of the process is supported and monitored by traceability and management software. This means that each step is verified, delivering complete records that are easy to access. Wassenburg provides a full range of detergents and disinfectants specially designed for the WASSENBURG® equipment. All combinations – that is, chemicals and equipment – are type-tested according to the latest standards. The type-test results provide evidence of an effective cleaning and disinfection process. Training and support are essential to our total solution. We offer training programmes for hospital staff and provide maintenance and validation to ensure the excellent and continuous performance of your equipment. We offer financial services to fit your financing needs.